Value Stream Mapping is a lean manufacturing tool used to create a material and information flow map of a product or processes. This tool allows companies to map the flow of products from receipt of raw materials through all manufacturing processes to shipping. 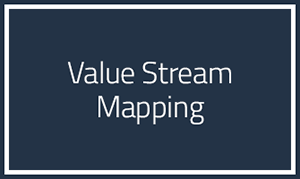 The value stream map identifies and quantifies the waste reduction opportunities that exist for a particular product or product family. This workshop is a one-day event to teach participants how to develop a value stream map for their facility’s use. Participants are trained to use the powerful Value Stream Mapping tool to create a current state map for a case study company, Acme Stamping. The participants will then analyze the current state map for Acme, identifying non-value added activities and then applying lean manufacturing tools to draw a future state map. Once the final future state map is created, an implementation plan can be created with dates and responsible parties documented.